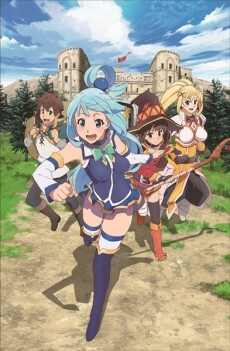 The second season of Kono Subarashii Sekai ni Shukufuku wo! The popular "alternate world home comedy" centers around Kazuma Satou, a hikikomori (shut-in) die-hard fan of games, anime, and manga. A traffic accident brings his disappointingly brief life to an end … or it should have, but he wakes up and sees a beautiful girl who introduces herself as a goddess. "Hey, I have some good news — would you like to go to an alternate world? You may only bring one thing you like with you."